The most dangerous part of any John Muir Trail thru-hike is the drive to the trailhead. The wilderness in general has far fewer hazards than your average freeway, and – unlike on the interstate – if you avoid gross lapses of judgment you can almost guarantee your survival. (On the road, you also have to contend with the gross lapses of judgement of others.) But, even in The Gentle Wilderness (as the Sierra Nevada is known), you can get yourself into trouble. In the summer of 2005 Hyundo Ahn decided to hike the John Muir Trail as part of a last, great adventure before returning to the Republic of Korea; he was a UC Davis exchange student whose time in the United States was coming to an end. He picked up a wilderness permit in the valley on Monday, June 20. Despite the heavy snow that year that lingered well into July, Ahn had planned to hike at an ambitious pace. He seemed “real confident” and listed an exit date, from Whitney Portal, of July 1. That meant he had to average more than twenty miles per day, which is a quick pace in the best of conditions. After the hike he intended to spend a few weeks touring the states before departing on July 21 for South Korea. He missed his flight that day, and after some investigation, no one could confirm that he had ever exited the wilderness. Yosemite National Park was notified immediately. Calls to several hundred wilderness permit holders revealed that he had been seen within the park on June 22 and 25. Any hiker who intended to summit Mount Whitney eleven days after departing Happy Isles would be more than seventy miles south of the border of Yosemite on July 25, not still within its confines. No one had seen him since. By the end of July, the search for Ahn had been scaled back considerably. 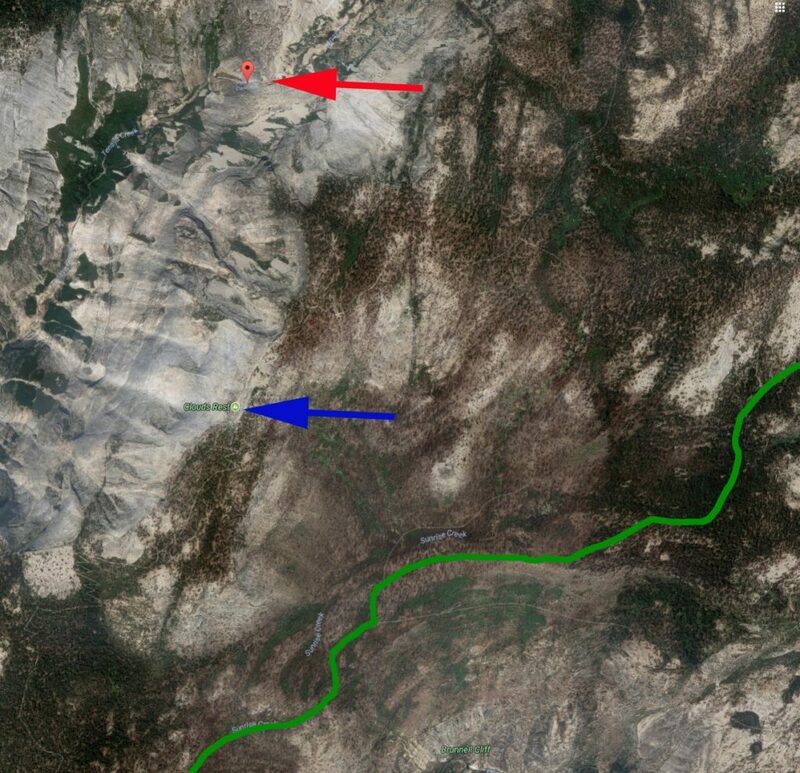 On August 5, a search team found his backpack near Pywiack Cascade (see red arrow, above) on Tenaya Creek. 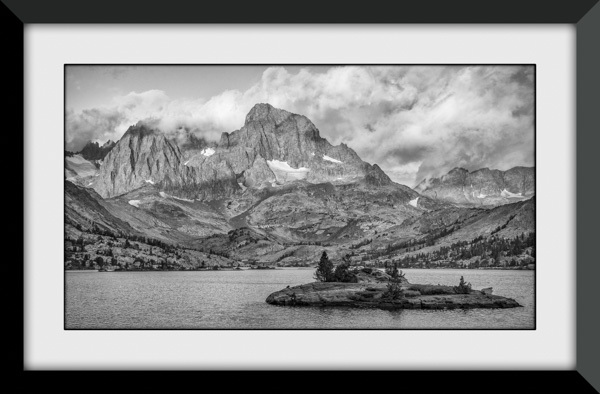 That is more than two miles from the closest point along the John Muir Trail, across rugged terrain. The next day his body was found in the creek, about a mile downstream. It had probably been submerged until the waters had receded just a few days earlier. How a JMT hiker could end up where Ahn was found is quite the mystery. The Cloud’s Rest (see blue arrow, above) trail is a popular alternate route, but it would presumably had even more snow than the standard route along Sunrise Creek. A camera found led investigators to believe than Ahn died on June 26th – just a day after he was seen by other hikers. It also appeared that Ahn had either attempted to cross the creek, or had fallen into it, and had been swept away and battered by the current. Even with this little data, it seems reasonable to conclude that Ahn’s attempted JMT thru-hike would probably been successful had it not been for the snow. The snow likely forced him off the putative routing, which led to a series of unfortunate decisions culminating at the bank of Tenaya Creek. Early season John Muir Trail hikers should not consider the presence of snow as a reason to necessarily abandon the hike, but one must be ready for the added difficulty, particularly as it applies to navigation. Are There Too Many People on the John Muir Trail? 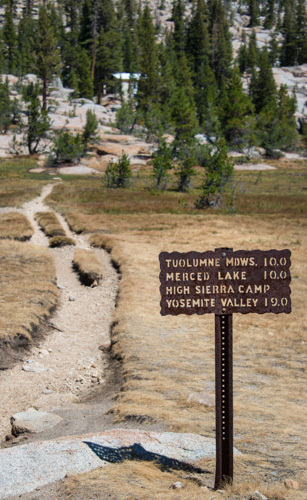 Is the John Muir Trail too crowded? I think that’s a great question; here’s my answer. I’ve spent most of my adult life being in charge of stuff, with admittedly mixed results. I know how hard it is to balance competing priorities, opposing interests, and conflicting policy. That’s why, even when I am tremendously frustrated with the way wilderness permits are issued or what is or is not permitted on the trail, I can’t help but have a huge dose of sympathy for wilderness managers who must try to follow the law, while keeping as many of their customers as happy as possible. I often find myself concluding that they are doing both a horrible job — and the best job possible — a conclusion as contradictory as the rules they are forced to follow. One of the complaints I often hear is that the John Muir Trail is a “highway”; that it is so crowded that it ruins the wilderness experience. My experience has been far better. I think the various government agencies have it just about right. The same is true at the other end. The two miles between the intersection of the Whitney trail and the John Muir Trail, and the summit, are probably going to be congested. (As will the summit, unless you get up there early.) I get up early on the last day of the hike, and leave Guitar Lake in the wee hours. I’ve never passed anyone (or have been passed) between Guitar Lake and the intersection just down from Trail Crest. What’s the rest of the trail like? My experience, hiking in July, August and September, is that on a normal day you will pass about a couple dozen hikers, many coming the opposite direction. Some days will have more; some days will have fewer. The most I ever encountered was a large group (they identified themselves as Sierra Club members) in the Rush Creek drainage; they had about twenty. The fewest occurred during a long day going over Mather Pass. I saw ONE hiker coming the opposite direction, and ONE hiker about two miles ahead (I saw him from the top of the pass). If you want to walk a couple of hundred miles and see almost no one, and you are a very advanced backcountry hiker, I recommend the Sierra High Route. If you want to meet a few marvelous people doing something they love, stick to the John Muir Trail. I think you’ll find that your fellow hikers will add, not detract, from the experience. My wife, Kathleen, and I have not yet thru-hiked the JMT together (although we have a hike planned for this year). 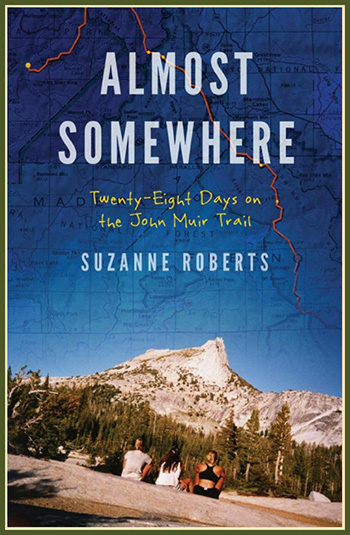 We have hiked together often, though, including a seventy-mile stretch of the John Muir Trail. We both look back at the experience with very fond memories. The most important was: no complaining! Morale on the trail is a fragile thing; we didn’t want discomfort on the hike to wield power over our experience. Either of us could point out that we were cold (and needed a layer), or had a headache (and needed a pill), or were dragging a bit (and needed a break). Commenting on a problem with the intent of finding a solution was fine. Just no gratuitous griping. The second rule was: the slower person leads. In our case that happened to be Kathleen, and she led every step of the way. Our goal was to hike together, and by putting her in front, with an agreement that she could walk at any speed she wanted, we accomplished just that. One afternoon, we met an older gentleman who was hiking the trail with his son—except that he wasn’t. His son had sped ahead to, well, we weren’t quite sure where, since we hadn’t seen him. (They were hiking northbound; we were going south.) Apparently, the son had decided to take a side trip and dad was on his own. Perhaps the son was having fun, but the dad (who was an inexperienced hiker) was worried that perhaps he had made a wrong turn. Last, both of us got to do what we wanted. Frequently, I would want to stop to take a picture (which often entails much more than, pause, click). Either one of us could call for a break. When we got to camp and had chores done, I liked to wander around, talk to other hikers, and explore. Kathleen preferred the commodious confines of the tent where she indulged in a bath (accomplished with the use of a couple of baby wipes). Even though we were together, we hiked our own hike! A couple of last notes, particularly for male backpackers. Assuming you succeed in getting your other half out on the trail, do whatever you can to make her comfortable while she’s there. 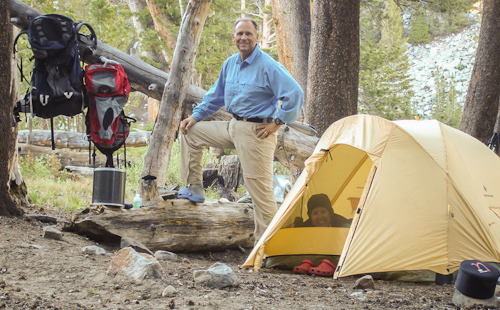 Do more than your share of chores, like setting up camp and cooking. Don’t be the guy who lets his wife do everything, and then can’t understand why she doesn’t want to go backpacking again! Last, if you’re trying to get your wife or girlfriend to try a long, multi-day hike through the backcountry, be prepared to hear all kinds of objections revolving around the bugs, the dirt, and sleeping on the hard ground. None of these may be the real problem. You can allay her worries by introducing your wife to an experienced female hiker so she can answer the question that really is bothering her: how does she do what bears do in the woods? All Your New Year’s Resolutions in One Place! It’s that time again—time for your annual flirtation with self-improvement. Good for you! I doesn’t matter if your record of resolution-keeping is dismal; the road to success, after all, is paved with failures. The quicker you get past all those missteps the quicker you will become the person you want to be! As diverse as we are, the similarity of our resolutions is amazing. I’ve listed below what is widely regarded as the top ten most common. What isn’t widely known is that the absolute best way to succeed at every one of these resolutions is to thru-hike the John Muir Trail. 1. Lose weight. You will ONLY eat what you carry. Really, this one is almost too easy. 2. Volunteer to help others. No one walks the JMT without being both the provider and beneficiary of many acts of kindness. From dropping things in the hikers barrels at Red’s Meadow or Muir Trail Ranch, to providing the latest data regarding water on the trail behind you, to a smile and a few words of encouragement to a fellow hiker with sore legs, the opportunities to help are plentiful. 3. Quit Smoking. You’re a serious endurance athlete now, training for the challenge of eight major passes and the summit of Mount Whitney. Serious endurance athletes don’t smoke. 4. Get a better education. You will learn more in three weeks on the trail than a year at the Ivy League, especially about yourself. 5. Get a better job. Before you jump to a new job you better know exactly what you don’t like about the present one, what the “better” job would look like, and have a plan to move between the two. Who has time for that? You will, if you are walking eight to ten hours a day, without any distractions. 6. Save money. Skip Wally World or that vacation to Europe. Instead, invest in some decent gear and prepare to go days without pulling out your credit card. 7. Get fit. There are two ways to do this, either train hard and show up at the beginning of the trail lean and strong (and enjoy the first week), or show up out of shape. You may not have as much fun the first few days, but you will finish the trail fit. Oh yeah. 8. Eat healthy food. Oh…I love this one. On the trail, it’s ALL healthy food. Buttery pasta for dinner and chocolate for dessert—pizza and ice cream on your zero days. Flout the rules while losing inches around the middle. 9. Manage stress. The stress on the trail is of a certain kind: should I eat lunch on the shore of that gorgeous lake or on this granite slab with the incredible view? Should I nap mid-morning or mid-afternoon? Or both? Oh, the decisions! 10. Take a trip. Forget the trip—why not an adventure! Fall and winter means less time for hiking, but more time for reading. This is a review I published a few years ago about a book worth considering. I’m not a big fan of memoirs. I’d much prefer the adventures of a heroic—and fictional—protagonist over an account of the humdrum lives most of us lead. Every once in a while I’ll sample the genre hoping to be pleasantly surprised. I rarely am. But when my Google Alert for the John Muir Trail pointed me towards Amazon.com, and a new book relating the story of a thru-hike, I decided to risk one more try. I’m so glad I did. I’m so often disappointed with memoirs because they fail to deliver three critical elements: a good story, good writing and, most importantly, honesty. Ms. Roberts delivers all three. Before they even reach the trailhead the two women become three. Then a young man decides to tag along, and less than twenty miles down the trail, a second man joins the group. Ms. Roberts gets us interested in all of them, and weaves their interactions together with perfect pacing. Some exit the story early. Some later. Reading through the book becomes very much like walking down the trail: you can’t wait to see what’s around the next corner. Thankfully, the prose is a joy. (Is that allowed in a memoir?) Although the hike itself was undertaken by the author when she was twenty years younger (they did the hike in 1993), the tone is exuberantly youthful. She has an ear for dialog that gently nudges the story forward instead of grinding it to a halt, and there isn’t a clunky sentence anywhere. Occasionally, you come across something so sublime that it deserves to stand next to the frequent quotes from John Muir, himself, that open her chapters. If you made your way to this website, chances are you’re interested in both the John Muir Trail and personal challenges. This book was written with you in mind. “Almost Somewhere” is almost perfect. The view from near the top of Mount Whitney, at dawn. Success! You’ve done it. For the first week after you exit from Whitney Portal you’ll feel like a different person. You are a different person. Truth be told, you may never be the same. 3. Clean and hang up your tent. Want a brand new tent on your next trip? Just stuff your current, perfectly good tent into its sack and store it somewhere hot and moist. When you next pull it out it will be ready for the trash and you can start looking for a new one. 4. Make a decision about your footwear. I’m a boot guy, and I would never use a set of boots for anything except a day hike after a John Muir Trail thru-hike. By the end of the hike my boots are really roughed up and the risk of catastrophic failure is just too great. My experience is that trail runners tend to be even less durable than boots. 5. Remove food & batteries. Get the food out of your bear canister and decide whether to keep it or toss it. Those freeze dried or dehydrated meals may last until the next hike, but their life is shortened considerably if you have removed the contents and repackaged them, or even if you have poked a pin-hole in the package so you could squeeze more air from inside. Also, get the batteries out of your devices. 6. Send thank you emails. 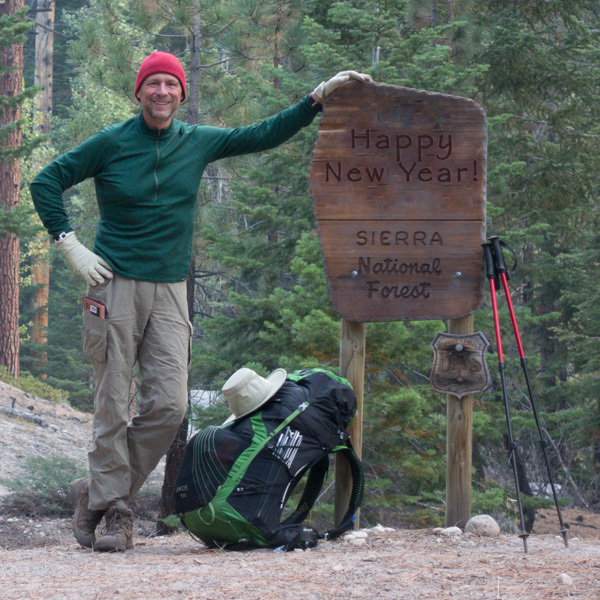 I have never done a Sierra Nevada hike without someone, somewhere, going out of their way to help. The assistance may come before or after the hike, during the hike, or somewhere I’m taking a zero day. I always try my best to get their email addresses so that I can follow-up. I also give my email address out from time to time, especially to people I lend a hand to. It always makes my day to get a nice email from them, later. It’s always risky to advise people on matters of courtesy. The difference between a friendly suggestion and an impertinent admonition is like beauty: it’s in the eye of the beholder. I’m going to walk out onto this thin ice for the simple reason that the JMT draws lots of first-time backpackers who, I assume, would like to know what’s expected. ~ No one goes to the wilderness to find noise. At your campsite keep the volume of your conversations low and avoid yelling at your friends across the lake. As the sun goes down, try to be even more restrained. Do you like a little music while you are eating dinner or setting up camp? If so, use earbuds. Are you an early riser who likes to get on the trail before dawn, like I do? Then break camp as quietly as possible. Even on the trail, keep your voice down a bit; you might be surprised at how far your voice will carry. ~ Respect people’s privacy. The easiest way to do that is to not camp too close to them. In almost all cases there are plenty of dispersed places to camp at least 100 feet apart. Even where that isn’t the case (Guitar Lake is one) at least ask your neighbors if they mind. But there is more than just selecting a campsite carefully. Some hikers like company on the trail and others don’t. About two-thirds of the nights I am on the trail I deliberately camp where I know there will be other hikers. Before dinner, I often make the rounds and strike up conversations, especially since I normally hike alone. When I approach another hiker at their campsite I always keep my distance and crank my “sensors” up to maximum sensitivity. If I detect any kind of discomfort, I move on. People often go to the woods to spend some time alone and I want to respect that. One last note on visits to campsites: if the hikers are in their tent I take that as a sign that they are not entertaining visitors. ~ Keep the trail clear. The general rule is that people going uphill have the right-of-way over those descending, but keeping the trail clear goes beyond that. If you are taking a break or making adjustments, move yourself and your gear well off the trail. I can’t tell you how many times I’ve almost had to step over a backpack. If you are slower than the hiker behind you, move out of the way and let them go by. (Here’s a tip: if you are the faster hiker, gaining on a slower hiker from behind, make some noise BEFORE you are within a step or two of the person in front. Imagine you’re walking along the trail, thinking that you are all alone, and suddenly someone says “Excuse me,” from a step behind you. No one likes to be startled out of their boots!) Lastly, especially at the top of a pass where the space can sometimes be limited, resist the temptation to spread out and claim every flat surface. Make room for friends! ~ If you feel a correction needs to be made, consider a little diplomacy. I think most of us try to mind our own business when we’re in the backcountry, but sometimes the infraction is such that you may feel you need to say something. Since you will not be speaking under the color of authority, you are going to have to persuade. Scolding a hiker who is doing something wrong probably won’t work. Scolding the leader of a small group of hikers in front of his or her friends could be especially counter-productive. Choose your words carefully. After all, you are trying to change behavior, not prove you are right. A few trips back a group near me started a good sized camp fire in an area where they were strictly prohibited. The situation was serious enough that I felt I had to say something. I struck up a conversation with the oldest member of the group, alone, and she was mortified to find out that they were breaking the rules. No one lost face, and the fire was out within a few minutes. I’m sure other hikers have other suggestions; I’d love to hear about them in the comments. 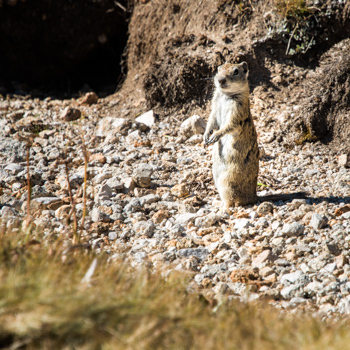 The Belding’s ground squirrel is by no means endangered, but you don’t see them as often as many of the other squirrels and chipmunks of the Sierra Nevada. One reason: they like terrain almost as high as the friendly marmots, greater than 6,500 feet. They are of unremarkable size for a squirrel and spend their time safely on the ground (no tree climbing and hiker tormenting for them). They prefer open areas where predators have little chance of sneaking up on them. Another reason you may not see one is that they like areas with grass just tall enough so they can duck and hide, but not so tall that they can’t see you well before you see them. They eat mostly plants, nuts, grain, roots—you get the idea—although they will on occasion eat bugs. They do not store their food, so their sole job during the summer months is to get as fat as possible. (I, on the other hand, do that in the winter.) Once they have the required stored energy they hibernate for several months. When they begin depends on the elevation. Males usually hit the sack first, followed by females. In subalpine elevations the long naps begin as late as September and end as early as February. At higher altitudes they can be underground between July and April! If you decide to be reincarnated as an animal you might want to consider something other than a male Belding’s ground squirrel. Female Belding’s ground squirrels are, shall we say, “in the mood” for less than five HOURS per YEAR. When the time is right the competition is pretty brutal. All this is interesting, but the real question is: who is this Belding fellow and how come he gets his own species of ground squirrel? Lyman Belding was born in 1829 in Massachusetts. After moving west he spent much of his youth on whaling ships in the Pacific. In middle age he acquired a book about birds and he was hooked, eventually moving to Stockton, California and becoming something of an authority on the birds of California. In 1885, during a trip to the Sierra Nevada, he somehow came into possession of a as-yet-unnamed squirrel carcass. He sent it to Clinton Hart Merriam, a noted zoologists, who named it after Belding. Belding’s ground squirrel has a step-sibling: the Belding’s yellowthroat, also name for Lyman Belding. 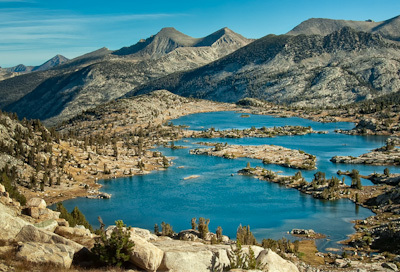 Readers of this blog know that I am a huge fan of the John Muir Trail, and, more generally, hiking in the Sierra Nevada. In fact, I like to call myself the unofficial chief evangelist of the JMT. I’m counting the days until my next adventure. #5. Yosemite Valley in August. I am not a Yosemite Valley snob. I love the valley and I enjoy spending time there. I got married there! Even I have to admit, though, that a hot, dusty, crowded August weekend is not a time when the valley is on its best behavior. Not only is it hot, dusty, and crowded, no one in the crowd seems to be having a very good time. Mostly I see people who are there because they felt they had to check it out while they were in California. They want to check the block and get the heck out. No fun. #4. Groups who have no idea what the rules are. During my last thru-hike I camped my first night out of Red’s Meadow near Purple Lake. Once I got my tent set up I decided to walk back down the trail, to the lake, for water. While on the trail, I tripped and nearly fell on my face. My tripping isn’t all that surprising; I’m not known for being particularly graceful. Except that I tripped on a tent rope, staked ACROSS the trail. A group of about a dozen hikers had camped right next to the trail and right next to the lake. Later that night, they had a good sized fire, despite the fact that they were prohibited. I found out later that the group had been earlier fined for camping at the Thousand Island Lake outlet stream. Apparently, no one learned a lesson. #3. 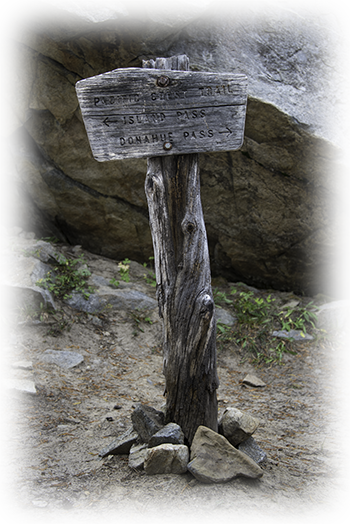 The middle third of the descent from the summit to Whitney Portal. Hard to believe after all the climbing you do on the John Muir Trail, but the stretch I dread the most goes downhill. It comes after the switchbacks, going to the portal. I’m always amazed that I still have knees when I’m done. #2. Not sleeping the first few nights. As I tinker with my sleeping gear, this has gotten a little bit better, but I still have problems at least the first two or three nights on the ground. A good sleeping pad helps, as does making sure you don’t get cold. Part of it is just psychological, especially since I am almost always camping alone. You never know what might be lurking out there! #1. The smell inside my bear canister. I look at bear canisters sort of how I look at dentistry—my life would be SO much more unpleasant without it, but that doesn’t mean I have to like it. Trying to stuff a canister into a reasonably sized backpack so that it is both in the right spot, weight and balance wise, and near the top, so that you can get to it for lunch, is nearly impossible. What is the worst, however, is the strange alchemy that takes place as the aromas from the different items within it blend. Despite the fact that they all, individually, smell pretty good, the combination is disgusting. I’m half tempted to leave it open at night to air out, but I’m afraid I’d scare all the bears away, and I really do like seeing them from time to time.